Summary : I was hoping for a vanilla icre cream replacement tea, due to the vanilla and cream flavorings infused into this tea. Sadly, this tea wasn't it. Yet, this tea was still good. It had a pleasant taste with no bitterness. Review : I'll confess. I did something I do my best to avoid doing when trying out new teas. What's that? Simple...I do my best anymore to avoid getting my hopes up. You see, once I raise the bar of expectations..and begin expecting too much from a tea...I am all too frequently disappointed. And as I have enough disappointments in life to deal with, there is no reason to willingly add in one more. So, I guess you can call me stupid...as I did indeed the raise the bar of expectations for the Chocolate Cream Black Tea that is available through the Dragonwater Tea Company (now out of business). I think this happened due to the absolutely wonderful aroma this tea had. When you rip open the package that the tea is in, well, wow, what a powerful aroma of chocolate - with a hint of cream too. And like some deranged person, when I smell chocolate, my hopes just inevitably go into overdrive. And so it happened with this tea. As I brewed up this tea, counting down the 3 minute timer as I watched this tea brew, I just knew...knew I tell you...that I would like this tea. Here is how Dragonwater Tea Company (now out of business) describes this tea on their website : "Black Chocolate Cream Tea. Full-leaf black tea flavored with cocoa bits. A real treat!" Yet, despite everything, I came away really disappointed with this tea. Truthfully, I should not have been surprised by this...but hindsight is one of those things that only come apparent after the foul deed has been done. Why was I disappointed with this tea? Well, let's put it succinctly. I do not really enjoy the flavor of straight-up black tea. Reminds me too much of coffee, a drink I truly despise. This is why I tend to hang-out in the "flavored or scented black tea aisle," not the traditional black tea aisle. I just happen to find the flavor of traditional black tea way too overpowering, and somewhat nasty too. Yet, I have found plenty of flavored black teas that I've enjoyed. The reason this tea was not one of them is because the powerful flavor of the high quality black tea leaves just overpowers the flavor of chocolate and cream. This is probably a good thing in some ways...as it shows the high quality leaf used by Dragonwater in this tea. But, darn it, where is the taste of chocolate? The taste of cream? This tea certainly has these two ingredients in it...as is evidence by the strong and beautiful aroma of this tea before brewed. But alas, once brewed, this tea becomes nothing more than a slightly weaker version of traditional black tea with just a "hint" of chocolate and cream. Ultimately, I guess my problem with this tea is that I was hoping beyond hope for a "chocolate tea" and what I got was a "black tea with a trace of chocolate in it." And since this tea wasn't what I was expecting...I didn't like it that much. Overall, this is a good tea, and if you like traditional black teas...well...this tea has your name on it. But this tea doesn't have my name on it, simply because the chocolate and cream flavors are way too weak once the tea has been brewed. Recommendation : Yes. If you enjoy the taste of straight black tea, I think you'll like this tea. This is especially so if you also want just a "hint" of chocolate and cream, too. However, this tea is no "chocolate replacement," so chocolate addicts like myself will need to look elsewhere. I give this tea 3 stars because it is a high quality tea, even though it doesn't meet my "taste bud criteria" for being a three star tea. But I realize that I have strange taste buds, too. 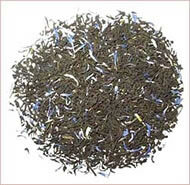 Impra Teas Earl Grey Tea : Just an average but rather flavorful generic earl grey tea.